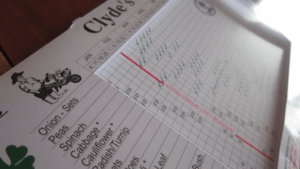 Several years ago I ran across Clyde’s Garden Planner. For only $5 delivered you get a card that slides something like a slide rule and does a wonderful job of indicating when you should plant different vegetable in the spring and fall. It features times to plant and when you can expect to harvest and spacing information as well. This is a product I can fully endorse as it not only is a really good implementation, it is only $5 and can save you far more that that in seeds that don’t grow due to planting at the wrong time. There is an app version for ios, but even though I work in IT, sometimes Old School is the Best School. This is an example of appropriate technology. This entry was posted in Gardening and tagged garden. Bookmark the permalink.